Retro travel luggage with wheels are fun and charming traveling companions. I’ve came across charming old fashioned vintage style trunk luggage in small to large sizes with leather straps around them during my travels abroad. They look so lovely, so adorable, so stylish and so elegant. These sure do remind me of steam locomotives, the quaint train stations and the passengers with their cool vintage trunk luggage or vintage chest style roller bags. It is important to have a really good suitcase when traveling as they may get thrown about by airport luggage handlers. Vintage style rolling luggage with four wheels on the bottom are convenient as you’ll just have to pull them along. These is also minimal risk of damage by airport handlers as these are not thrown about by them. These vintage looking luggage with wheels can be rolled along when loading onto the cargo hold. 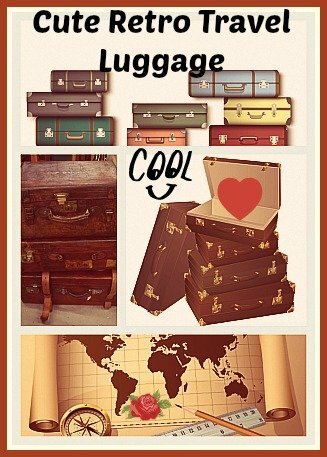 Unique, gorgeous and eye catching, you can’t miss your lovely vintage style luggage when picking it up from the luggage conveyor belt. Made of durable polycarbonate, this ultra-smooth 360 degrees spinner luggage measures 26″ x 11″ x 17″. Featuring a vintage style travel print showcasing the glamorous city of Paris, this 26″ vintage inspired spinner comes protected by a layer of clear coat which also gives it a beautiful glossy shine. Cool features include a fully lined interior that comes with builtin zip divider, compression strap and mesh pockets for your smaller items. Built-in TSA lock is included. It has a weight of about 9.10 lbs. This expandable 4 wheel vintage traveler comes with a zipper released expansion system that can create up to 20% more packing space. It is also available as a 2 or 3 piece spinner set. 21″ Carry On: 21″ x 9″ x 13.5″ / 6.2 lbs. 26″ Spinner: 26″ x 11″ x 17″ / 9.1 lbs. 30″ Spinner: 30″ x 13″ x 18.5″ / 11.2 lbs. The vintage traveler 2 piece spinner set comes with 2 different combinations. You can choose the 26″ and 30″ 2 piece spinner set or the 21″ and 26″ spinner set. This 20″ retro style rolling trunk luggage is made of durable ABS material. It is fitted with 4 multi-directional spinner wheels. The interior comes with a mesh zip pocket to hold your accessories/toiletries and criss-cross elastic bands to hold your clothes in place. The corners are wrapped with polyvinyl chloride for additional protection. It has a sturdy ergonomic telescoping handle. Push it along or use the shorter top carry handle when carrying. There are no side handles though. This classy vintage looking trunk luggage measures 13″ L x 8″ W x 20″ H and weighs 6.5 pounds. Many customers have commented that they have no problem using it as a carry on luggage. Be prepared to get compliments and admiring looks at the airport or hotel when pulling along your cute retro rolling trunk luggage. This wooden construction retro style luggage with faux leather accents and metal latches comes with a unique European travel print covering the outside of the luggage. The larger trunk measures 12″ high x 17″ wide x 6″ deep. The smaller trunk measures 1o” high x 14″ wide x 4″ deep. Made of heavy duty PU with handcrafted stitching, this 2 piece vintage inspired trunk design hardside luggage set comes in 2 different sizes. The larger 24″ roller suitcase measures 23″ x 14″ x 9″. It has 4 roller wheels and 2 TSA locks. The 12″ bag measures 12.4″ x5.1″ x8.2″. You can attach the bag to the roller suitcase with a complimentary strap. With 2 adjustable handle heights, this makes it easy for users with different heights to handle the 24″ roller. The smaller luggage can fit into the larger one. Those who love pink retro luggage will really love the lovely pink set.The pink color luggage comes with the same features and sizes. It is really eye catching. This piece of retro inspired travel luggage with wheels is made from PU leather. The material is strong, waterproof and lightweight. Features include aluminum draw bar, side and top leather handles as well as 360 degrees spinner wheels. There are 2 internal pockets for your accessories/documents. This vintage inspired luggage come in 3 sizes; large 29″,medium 24″ and small 20″. There is a wide choice of colors. I really love the orange one, it looks so cute and so yesteryear. To give it further protection from scratches and dirty stains while traveling, you can cover it with the suitcase cover (buy separately). This lovely retro looking luggage comes in sizes of 16″, 18″ and 20″. The cool vintage looking old map design carry on luggage as well as the spinner wheel trolley luggage are made of PU material. Price shown is for 1 piece luggage only. This luggage set includes one 20″ and one 24″ vintage retro luggage suitcase. The 20″ is meant as a carry on cabin luggage and the 24″ is meant as check in luggage. The 20″ will be nested inside the 24″ when shipped. 24″ luggage measures 17″ x 10″ x 24″ and weighs 9.4 pounds. It is made of 100% tough ABS hardshell material and both suitcases are not expandable. It is available in 3 colors combination namely violet and ivory, carmine and ivory as well as blue and rose. The 4 multi directional spinner wheels allow for easy and smooth rolling. It has a fully lined interior with pockets and criss cross straps for holding clothes neatly in place. It comes with a 3 digit combination lock which is preset to 3 zeros. The retro travel luggage with wheels make lovely gifts too. Useful and beautiful, these modern retro luggage sets are cool and cute making it a great way to travel in style.